In the Equipment Room, you can find tons of information about sound gear. Everything and anything you might need to start recording, editing, arranging and playing with sound. hardware to record the world around you. audio programs to turn your recordings into anything you want. turntables to play vinyl records. All the products we've listed are ones that we've used and think are great. But be careful, sound can become an expensive hobby. (For tips on where to buy, please see the bottom of this page.) There's always a shiny new piece of equipment. Remember, these are just tools. Your brain is the best tool you'll ever own! In each section, we've listed expensive, mid-level and affordable options. Rule of thumb, start cheaply. Use the simplest tools you can find, and keep your workspace streamlined and spare – that way the gear doesn't clog up your brain, and you can focus on ideas. 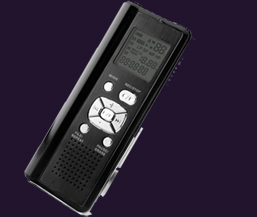 A digital audio recorder (DAR) is simply one (or more) microphone that records sound to internal memory. When buying a recorder, chose one with a good mic, that can run on batteries for a long time, that can save files in many different formats, that is easy to connect to your computer, and that is easy to use. The last thing you want is a tool that's impossible to work. Also, keep in mind microphone types. Each microphone is built to pick up certain sounds. An omni-directional mic records everything around it, no matter where you point it – like a fly on the wall. At the other end, a shotgun mic will only pick up sounds within a very small area. Every recorder has a certain type of mic. Find out which one. An expensive option, but this recorder is well worth the $$$ if you can afford it. It's easy enough to use right out of the box, but there are limitless features to spend years mastering. What makes this recorder so sensational are the two microphones, which record crystal clear audio. It can even record four tracks simultaneously – so if you record a large crowded room, you could actually zero in on one person's voice across the room after the fact. SOUND BENDER RECOMMENDATION. The Zoom H1 makes an excellent birthday present. 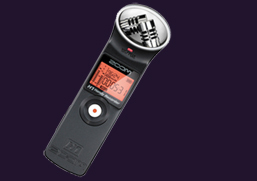 From the trusted audio brand Zoom, the H1 is a tiny recorder with a powerful punch. This is the easiest recorder to use, and though it has less features than his big brother the H4N, the H1 is a Sound Bender's best friend. Best value for your money. The Coby CXR190-2G is an affordable and reliable recorder, and a great way to get into the groove. It holds tons and tons of audio, and is so small you might forget it's in your pocket (great for stealth recording, shhhhh). The Coby was designed to record voices, and it can activate simply by talking. However, the audio quality is just okay, and the omni-directional mic makes it difficult to shape your recordings. Aside from digital recorders, you can also record to old cassette tapes and mini cassette tapes – or anything that will record audio. Using a Griffin iMic, at about $30, you can transfer any audio from any device to your PC or Mac. For the truly adventurous, we recommend picking up an old reel-to-reel portable recorder. These are just like cassette recorders, only the tape comes in reels and is not enclosed in plastic housing – you then have free range to alter the tape however you want. However, old blank tape can be expensive and difficult to find. You can start recording sound with things you can find around the house. Don't have a microphone? I bet you have headphones, though. Headphones can become a microphone – all you have to do is plug them into the "mic" input of your phone (if it has one), or an old tape recorder you found in the garbage. Doing things for free means you will have to be creative and improvise. Always be on the lookout for things people throw away or don't want anymore. Pick up anything: cheap mics, old cables, broken looking tape recorders. Store all your cables in a special drawer so they don't become trip wires. And then get a screwdriver and take apart anything you find. Discover how it works, scavenge for parts, make your own creations. Be a Sound Bender. Now that you've recorded some sounds, it's time to play with them. With only two programs, you could turn a three second clip of a man laughing into a three hour symphony. There's really nothing you can't do. But remember to get outside and record real sounds – it's good for you! There are two types of sound programs we will be reviewing: sequencers/digital audio workstations(DAWS) and sound editors. You use a sequencer to arrange the sounds exactly as you like. You use a sound editor to tweak, edit, and screw around with your sounds before bringing them into your sequencer. 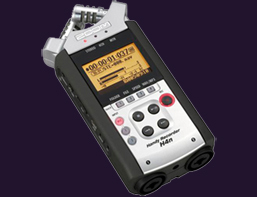 Most sound editors are also sound recorders – where you can record sound from outside sources or from somewhere online. It is a good idea to use a midi controller with your sequencer – some look like keyboards, others like video game controllers. Basically, they allow you to control your sounds from something that resembles an instrument. Sound software can be very expensive. However, most programs offer a free demo as well as a more affordable package without the bells and whistles. Before you spend $300 on a program you might hate, download the demo, and if you like it, buy the affordable package. As well, there are tons of youtube videos with tips and techniques for every sound program out there. Ableton Live is most intuitive and fun sequencer/DAW out there. It is ridiculously easy to use, but can take years to master. It just gets out of your way. It can be used for detailed arranging by the microsecond, but it's also ridiculously fun to just horse around on it and make weird sounds. Ableton Live Intro has everything you need. 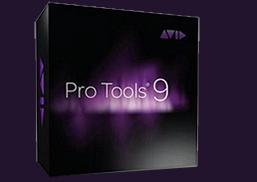 Pro Tools was and continues to be the industry standard. Almost every movie and every song today is made using Pro Tools. If you are interested in working with sound when you grow up, learn Pro Tools, because it will probably still be around then. Pro Tools is a great sequencer/DAW, but it is a big expensive program, and it's difficult to learn and complicated to use. The Avid Recording Studio, however, is a great value. Garageband is simple and somewhat free DAW/sequencer. It is easy to use, and a good way to learn about sequencers and DAWs. However, you cannot always control everything you'd like, and after a while, you might outgrow it. Also has a cool iPad app. Only available for Macs. Forget the $400 box, the Audio Studio is a fantastic sound editor with everything you'll need to make a violin solo sound like a squealing pig, or a squealing pig sound like a violin solo. It's also is a great way to record sound from an outside source, like a turntable, or from things you find online. Another affordable sound editor with similar features to Sound Forge. Which one you chose will be a matter of taste. Audacity is an absolutely free sound editing and recording program that works on all computers. It is always being updated, and all updates are also free! 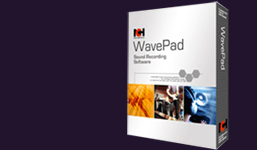 It is powerful sound editing and recording software, and a great place to start. But make no mistake, Audacity can churn out professional sounding projects. SOUND BENDER RECOMMENDATION! A great turntable is like a great watch – it is a precision instrument. But you don't need a Rolex if you only want to know the time. There are hundreds of turntables out there, one for every season and occasion. To start with, chose a turntable that comes with everything you'll need to start listening right away. (Higher end turntables often do not come with cartridges, pre-amps and cables – you can't just plug them in and hear sound.) Many new turntables also now come equipped with a built-in USB port, which makes digitizing your music a snap. Turntables can be manual or automatic. An automatic turntable starts spinning, moves the tonearm and even shuts down when the record is over, but they can be annoying and have minds of their own. With a manual turntable you have to do everything yourself, but you are in more control. This is a great and more affordable alternative to the 1200. They have more plastic in them, but they look cool and play excellently. It can even play records in reverse! Best, the LP120 has a built-in pre-amp, which means all you have to do is plug it into your computer or any stereo with an "AUX" in, and presto, you've got music. The LP120 also has a USB port for easy digitizing. BEST VALUE.! 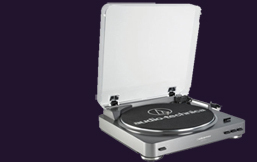 A very easy to use turntable that comes with everything you need to start listening right out of the box. It has a built in pre-amp, a USB port, and comes with a cartridge (needle). Why not go portable? With this turntable you can listen to records anywhere with its built-in speaker. The thing even runs on batteries! Take it to school with you; it'll fit in your bag. It also has a USB port for easy digitizing. It is more than possible to buy a working turntable for less than ten dollars. They're everywhere! Go to thrift stores, garage sales, swap meats, church sales, flea markets, the dump. Unless the thing looks like a million bucks, don't spend more than $10 on it. Before you buy a turntable, check to see if it still has a needle in the tonearm. It's okay, you can touch. The needle should feel firmly in place, not loose or jiggly. DO NOT BUY A CHEAP TURNTABLE WITHOUT A NEEDLE – YOU WILL NEVER FIND A REPLACEMENT. EVER. Make sure the power cord isn't damaged/missing, too. You will probably need to find an old pre-amp and receiver and cables to get it to play, but that's part of the fun! All the prices we've listed are ballpark figures. You might pay a little more or a little less. You can probably find deals on all of these items online, although we don't recommend it. It is best to go a store and try the equipment out. The big audio stores like Guitar Center and Sam Ash are usually very well-stocked, but their salespeople are pushy to the extreme, and if they don't push a much more expensive product than what you want, they will push other products they say are essential (they're not). Big box stores like Best Buy and Wal Mart can have good prices, but their salespeople are generally poorly informed. The solution is to try local independent music stores. They will appreciate your business. An online retailer specializing in music and sound products isturntablelab.com. They've been in business since 1999 and their reputation is impeccable. B&H Photo also sells online, and their prices are usually the best. For some truly free turntables, see the Contests, Projects , Challenges page, and got to the Do-It-Yourself section.